I may live in France, speak relatively understandable French and love to hear French spoken around me, but there is no getting away from the fact that I’m English and live in an English speaking household. However, I have noticed that here in France, English words seem to be creeping into daily life as I see them all the time when out and about. For a brain like mine, that functions in English and copes in French, an unexpected mix of the two tends to confuse me, although sometimes it just amuses me. 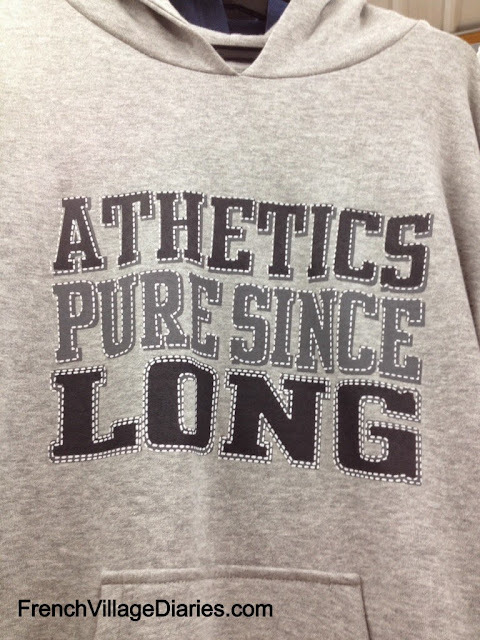 This sweatshirt is just one example that put a smile on my face. 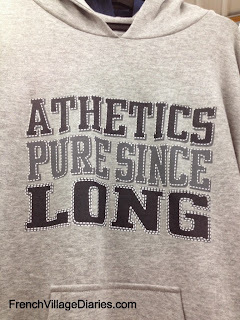 It seems English words on clothes are cool, whatever the spelling or whether they mean anything. The principal at Ed’s Collège (secondary school) is determined to make the most of the influx of English speakers in the community and in 2009 set up an English conversation lunch club. It has been something I have been involved in from the beginning, which was long before Ed started at school there. As well as being run by volunteers it is voluntary for the kids too (yes amazingly they do actually choose to do extra English in their lunch break) and is a great way for them to hear English spoken by English people. The start of this new academic year saw more subscribed than any previous year. I’m astounded that anyone puts their names down, but they do and they come back the following year. In the heavily accented words of the rather stern deputy head “it’s awesome” and the kids certainly think English is cool. There is, however, a French body, l’Académie française who seem determined to remove these pesky English words that have slowly crept into French vocabulary. I’m guessing as they are based in Paris they haven’t spent much time out and about in the provinces noticing what I’ve noticed. Examples I’ve seen are the kitchen shop offering “Cuisines You”, the clothing company encouraging you to “Fais-toi un New Look”, the removal company describing themselves as “Les Gentlemen du demenagement” and the decorating company advertising “Colour Dream”. My favourite however is the local social security department recruiting call centre staff by a process they call “Job-dating”. I’ve not even heard of this in English, but similar to speed dating, candidates are given seven minutes in front of the panel to show off their motivation and competences. Let’s hope the successful ones are as quick to respond when they start work! Couriel is good, Email is not. Mot-dièse is good, Hashtag is not. Équipe is good, team is not. Vintage is another word that has crept in uninvited. Un sac vintage (a vintage bag) should be un sac des années 1960 (a bag from the sixties). There are some examples where the French alternative is rather long winded, for example à retourner asap (to return as soon as possible) should be à retourner dès que vous pourrez. There are others where the anglo-isms are so bad they make my French look good. I would never think to use être booké (to be booked) or être overbooké (to be double booked). I agree that être occupé or n’avoir aucun moment de libre would be much better. They also remind us that it is forbidden to write Lundi or Octobre as there is no place for capitals letters for the days of the week or months of the year in French. There ends my lesson for today, but I will be keeping an eye on the Dire, ne pas dire section and although l’Académie française may disagree I think English is still cool.